With Thanksgiving behind us, this marks the first Motivation Monday of the 2017 holiday season. Along with the hustle and bustle of cyber shopping, decorating and meal planning, it’s also the time of year many of us find our calendars filled with family get-togethers, office parties and drinks with friends. For me, this season has turned extra festive now that I am newly engaged! (Can’t you just feel my smile jumping out at you from these typed words?) That means I’ve received even more of those “we-must-get-together-and-raise-a-glass-before-Christmas” invitations. With many bubbly-filled evenings in my immediate future, I realize now more than ever, I’d better follow my own tips when it comes to trying not to throw all those healthy habits out the window between now and New Year’s Day. Cocktail Control: The every-other-drink rule works just as well at a holiday party as it does for happy hour. 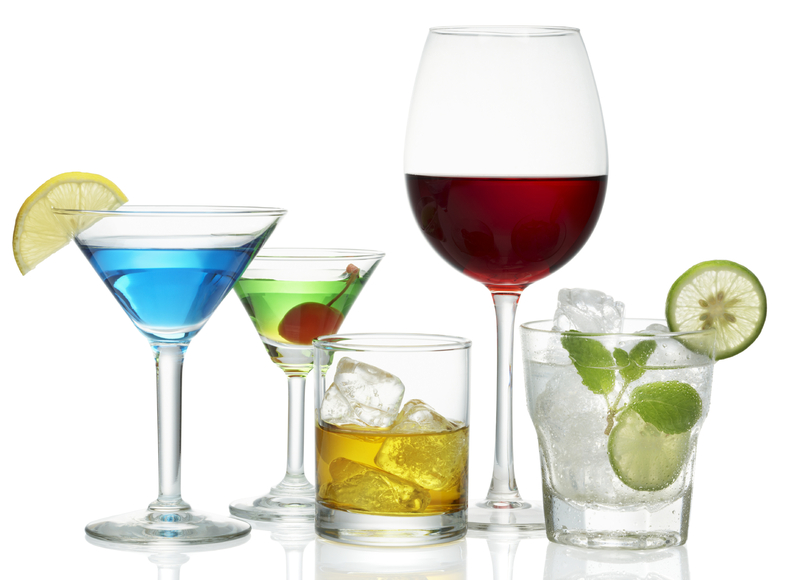 To space out the alcohol consumption, start with a glass of wine or a cocktail, and when your glass is empty, switch to a glass of water or seltzer for your next beverage. 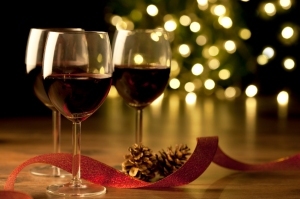 Choose “Smart” Foods First: More and more holiday parties are a cocktail and appetizer bonanza. Load up on some of the healthier options first, including the crudités – celery sticks, carrots, bell pepper strips, broccoli and cauliflower. Tip: Try not to drown veggies in high-calorie dip. Instead, use mustard for a tangy, low-calorie alternative Another idea: Attack the protein! I love shrimp, and with 18 grams of protein in a 3 oz serving, there’s no reason not to! (Unless you are allergic to shellfish, of course.) Sushi, skewered chicken or beef tenderloin strips are also better options than cheesy breads or creamy dips. The Dessert Dilemma: What could be better than arriving at a party to find nothing but cocktails and cupcakes or wine and chocolate? If you know you’re attending one of these sweet celebrations, be sure to eat a small, sensible meal before arriving and tearing into the treats. When you do dig in, split a cupcake, cookie or piece of cake with a friend. If there’s any fresh fruit, eat that first. Get Moving! I know, you’re busy. Trust me – you can find the time to exercise. Pushing through two four-minute Tabatas or dare I say a whole 20 minutes of cardio or half of your favorite workout DVD is better than nothing. If you have a party after work, hit the gym or take a walk in the morning. If you live in a city like I do, don’t let the cold stop you in your tracks. Throw on an extra layer, pack the party shoes to go and burn some extra calories by walking to work and/or to the festivities.Remember, this is supposed to be the most wonderful time of the year. For me, that includes enjoying some holiday cheer…along with some chocolate and cupcakes! Remember sometimes all you need is a little planning to make it through the holiday season and stay on track with your goals to have fun, be fit and feel fabulous! On this particular Motivation Monday, I start the work week recovering from an amazing wedding and gearing up for three nights sure to include cocktails and chocolate. Obviously, this is not the time of year to skip those workouts! While I’m not an early-morning workout gal, at this time of year, even I have to adjust my schedule to keep active. I consider it a small sacrifice to make in December to hopefully maintain my weight through the holiday party season. Along with getting those workouts in, there are some other ways to get through the next few weeks of filled with hors d’oeuvres and holiday cheer. Here are some tips that will help me get to New Year’s Day without feeling like I completely fell off the health and fitness wagon. Plan Ahead: If you know you’re going to enjoy some cheer after work, do NOT starve yourself all day. Eat a sensible breakfast and lunch and don’t forget to have a healthy snack up to one hour before the party starts. This way, you won’t arrive with a rumbling stomach and grab the first thing you see. Choose “Smart” Foods First: Many office holiday parties and even get-togethers with the neighbors feature lots of appetizers. Load up on some of the healthier options first, including the crudités (celery sticks, carrots, bell pepper strips, broccoli and cauliflower). Just try not to drown them in high-calorie dip. Another idea is to seek out the protein. I love shrimp, and the good news is with 18 grams of protein in a 3 oz serving, there’s no reason not to! Sushi, skewered chicken or beef tenderloin strips are also a better option than loading up on the cheesy breads or creamy dips. The Dessert Dilemma: Things like cocktails and cupcakes or wine and chocolate remain popular party combos here in New York. I admit, I’m a big fan of these themes, but they obviously wreak havoc on your efforts to eat healthy. If you’re attending one of these sweet celebrations, you definitely want to eat a sensible small meal before arriving at the party and diving into the sweets. When you do dig in, split a cupcake, cookie or piece of cake with a friend. If there’s any fresh fruit, eat that first. Cocktail Control: The every-other-drink rule works just as well at a holiday party as it does for happy hour. To space out the alcohol consumption, start with a glass of wine or a cocktail, and when your glass is empty, switch to a glass of water, seltzer or diet soda for your next beverage. Get Moving! I know I mentioned this at the start of this post, but it bears repeating. You can find time to exercise. Pushing through 20 minutes of cardio or your favorite workout DVD is better than nothing. If you have a party after work, hit the gym or take a walk in the morning. If you live in a city like I do, don’t let the cold stop you in your tracks. Throw on an extra layer, pack the party shoes to go and burn some extra calories by walking to work and/or to the festivities. Remember, this is supposed to be the most wonderful time of the year. For me, that includes enjoying some holiday cheer…along with some chocolate and cupcakes. With a little planning, we can all make it through the holiday party circuit and still have fun, be fit and feel fabulous! For lots of people, Friday is the perfect excuse to head out of the office or leave the kids with a sitter and proceed directly to happy hour. Anyone who knows me will tell you I like my red wine, and enjoying a glass or two on a Friday evening is one of my favorite ways to wind down after the work week. If you don’t drink alcohol, your Friday night plans may still involve some good conversation and “decadent” snacks with friends. Regardless of what’s on your agenda, the good news is you can enjoy a little downtime without completely blowing your efforts at living a healthier lifestyle. Happy Hour & Hunger Don’t Mix: There’s nothing worse than arriving at a bar or a friend’s house with a stomach that’s growling for anything. That’s when you inhale half a bowl of chips or order the loaded potato skins without a second thought. If you can, have a healthy snack within an hour before you go out so you’ll be less likely to indulge in the high-calorie, high-fat snacks. Some of my favorite pre-happy-hour snacks include: 94% fat-free microwave popcorn and an apple; a low-fat string cheese and an apple; or a serving of raw almonds and a plain fat-free Greek yogurt. If I’m not ravenous, I may be able to enjoy one drink and one glass of water and hold off on eating altogether until I have healthier options back at home. If I’m having too much fun to leave, at least hunger won’t keep me from noticing some of the better menu options, like a salad or steamed veggies. Finally, remember, even the best laid plans can go awry. If you do go a little overboard at happy hour, don’t sweat it. There’s always tomorrow when you can re-hydrate, make better food choices and get in a good workout at the gym, pop in your favorite exercise DVD or take the kids or the dog for a long walk. Even the most disciplined people need to let loose every once in awhile as part of our journey to have fun, be fit and feel fabulous!